Rotor's Qarbon Q-Rings provide a sleek, polished look that's as stiff and light as it is eye-catching. Rotor's bonded a 3K woven, high-modulus carbon sheet to the outside of a no-Q standard ring to reinforce the standard ring´s structure. 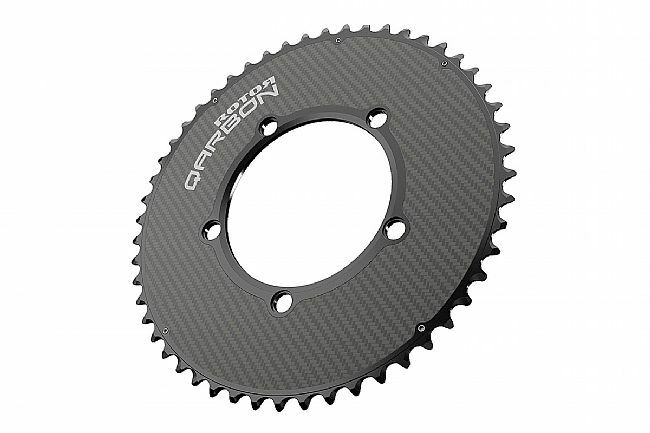 Carbon fiber's structural properties allow for a more aggressively-machined aluminum section in comparison with a conventional aluminum chainring. 8% lighter with 20% increased stiffness, No-Q Rings Qarbon give you all the benefits of Standard Rings but with carbon fiber accents to both reduce weight and distinguish your bike as a performance machine inline with your sophisticated tastes.